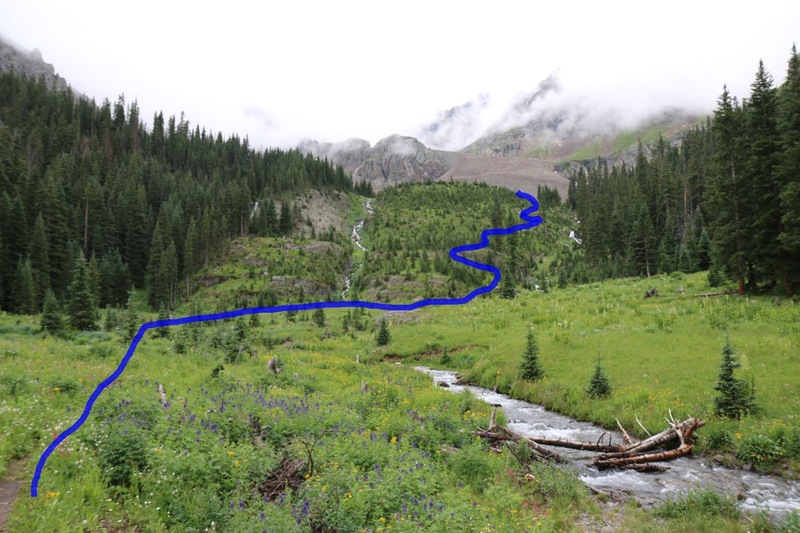 The Blaine Basin trail is located in the Mountain Division of the Uncompahgre National Forest between Ridgway and Telluride, Colorado. 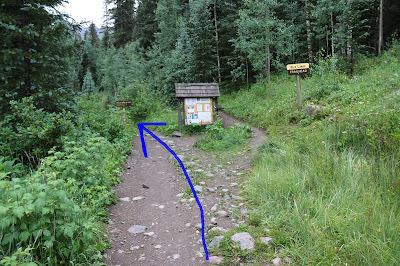 The trail begins at the Blue Lakes trailhead where it follows the Dallas trail for a little over 1 mile to Wilson Creek where the Blaine Basin trail begins. The trail climbs the Wilson Creek drainage for about 2.8 miles to where it comes to an end at Blaine Basin, an alpine bowl that is nestled beneath the northern slopes of Mount Sneffels and Cirque Mountain. 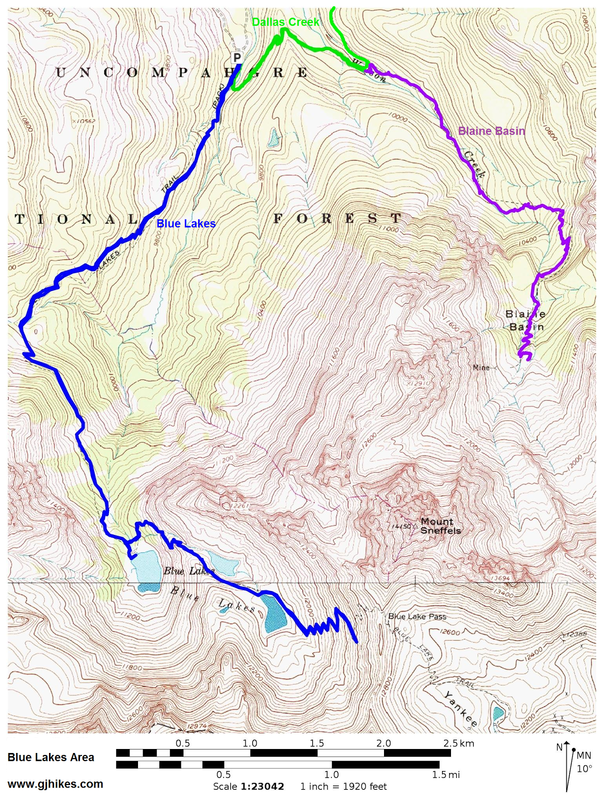 Numerous waterfalls and an up close view of Mount Sneffels highlight the hike into Blaine Basin. To get to the trailhead from Ridgway drive about 4.8 miles west on Highway 62. Turn left at the Dallas Creek sign. 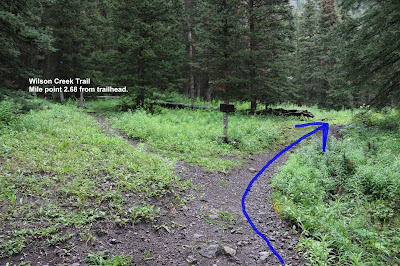 Follow Ouray County Road 7 for about 8.5 miles to the trailhead staying to the right near the 2 mile point where Country Road 7A splits off on the left. During dry weather the road is normally passable by 2-wheel drive vehicles without any problem. 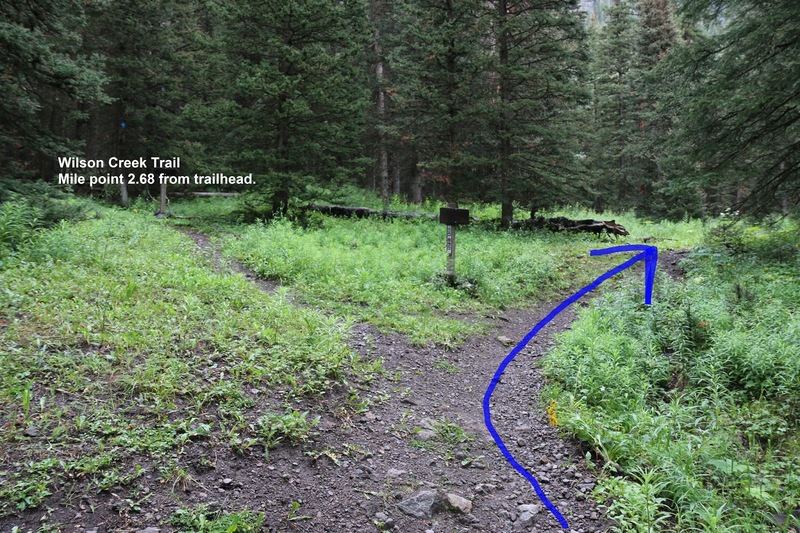 The trail splits a short distance from the trailhead with the Blue Lakes trail following the right fork and the Dallas trail following the left fork. 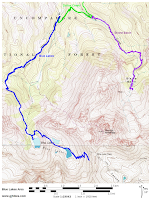 To get to the Blaine Basin trail take the left fork and follow the Dallas trail for about 1.3 miles. The Dallas trail begins by crossing a bridge over East Fork Dallas Creek. From there the trail makes a gentle climb heading eastward. 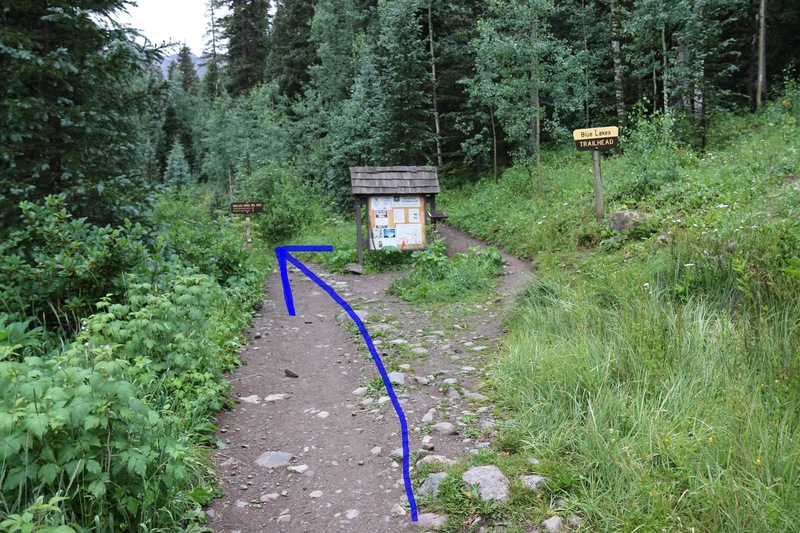 Avoid any unmarked trails or roads as you hike along the Dallas trail until you reach the 1.2 mile point from the trailhead. Just before the route crosses Wilson Creek a singletrack trail departs on the right. The singletrack leads to a couple of logs that span Wilson Creek and serve as a bridge. If the water is low or if you are on a horse or mountain bike you can skip this side trail and follow the Dallas trail across the creek. Both routes reconnect on the other side of the creek. When we hiked Blaine Basin for this post one of the logs in the bridge was broke in the middle. It also happened to be raining at the time and the other log was pretty slippery. We decided to go ahead and wade across the creek rather than attempt the bridge. 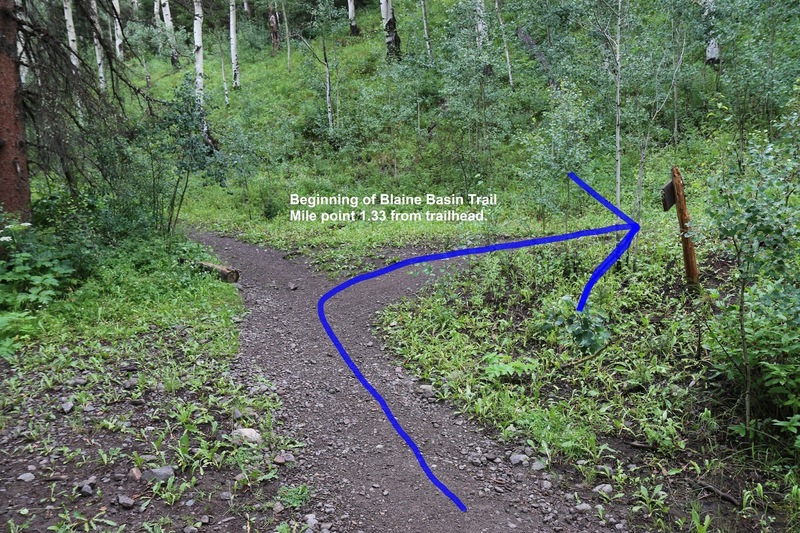 The official start of the Blaine Basin trail begins after about a tenth of a mile from crossing Wilson Creek. The Blaine Basin trail makes an easy climb up the Wilson Creek drainage. Enroute it crosses Wilson Creek on a 4 log bridge to get back over to the west side of the creek and after a while it recrosses to the east side of the creek on a bigger 2 log bridge. The hike along the creek is very pleasant as you continue up the valley. Eventually a high cascading waterfall comes into view where Wilson Creek plunges down the cliffs below Blaine Basin. At the 2.68 mile point from the Blue Lakes trailhead the Wilson Creek trail branches off on the left. 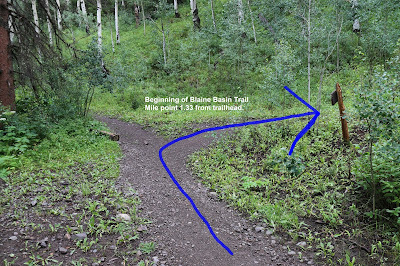 A sign at this point indicates that it is 9 tenths of a mile from this spot to Blaine Basin. 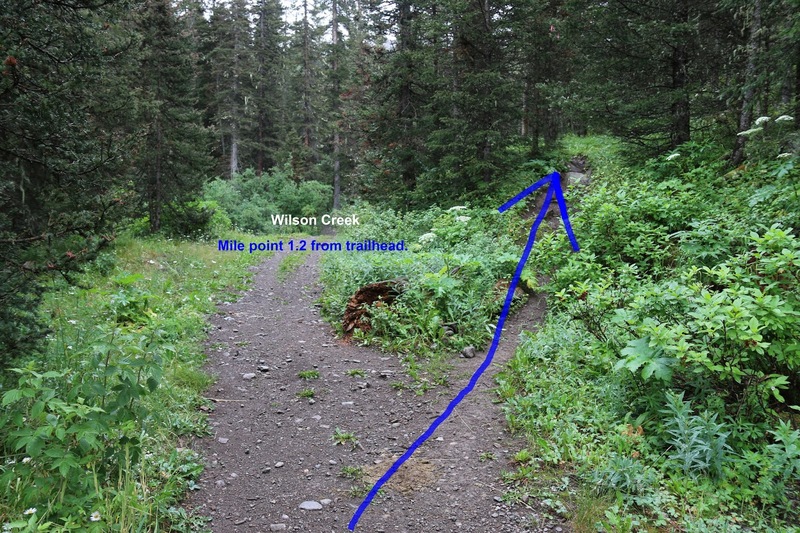 The last stretch of the Blaine Basin trail, beginning at the Wilson Creek junction, is closed to mountain bikes. The last section of the trail gets much steeper, and rocky in places, in comparison to what it has been up to this point, as it climbs to get higher than the cliffs with the waterfall that was seen earlier. At the point the trail enters the basin there are four cascading waterfalls that can be seen that feed into Wilson Creek. One of them is far off to the left in the trees. From here you can continue hiking up to the upper area of Blaine Basin where there are some magnificent closeup views of Mount Sneffels and Cirque Mountain. The trail crosses a branch of the creek but without the aid of any logs this time. The last bit of climbing to get to the upper basin is easier than the last bit of climbing to get to this point so if you have even a little bit of energy left in you then keep going. None of Mount Sneffels was visible when we arrived in the upper basin but after waiting about a half hour all but the top 500 feet or so could be seen. At that time the clouds began rolling back in and the rain started picking up again. We made it back below treeline before the thunder and lightening started. There are several good places in the trees around Blaine Basin for backpackers to set up a camp. The weather can change very quickly with approaching storms being hidden by the high ridges and coming upon you very quickly. It is always best not to camp out in the open above timberline and not to camp too close to the trail where others feel like they are walking through your camp. Primitive campsites are also available around the Blue Lakes trailhead and about a half mile away along the road leading to the trailhead. Blaine Basin is a great hike with world class scenery and numerous waterfalls and it gets only a small fraction of the hikers that the Blue Lakes trail does. If you would like to see it for yourself then all you have to do is 'Take a hike'.